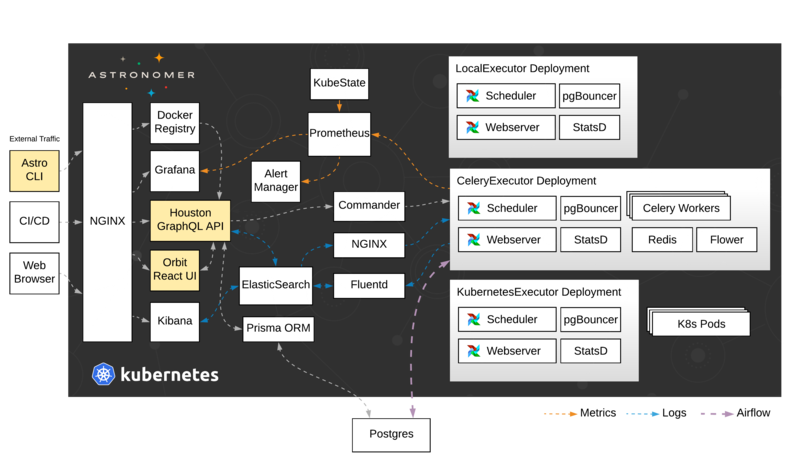 Astronomer Enterprise Edition allows you to run a private version of the Astronomer platform within your own Kubernetes. The Astro CLI helps you develop and deploy Airflow projects. Even if you are not interested in running Astronomer Enterprise, our CLI can be used to to run a containerized Airflow environment on your local machine. Houston is a GraphQL API that serves as the source of truth for the Astronomer Platform. Commander is a GRPC provisioning component of the Astronomer Platform. It is responsible for interacting with the underlying Kubernetes infrastructure layer. Orbit is a GraphQL UI that provides a clean interface to manage and scale Airflow environments. Astronomer Enterprise comes built in with a series of Grafana charts that give you real time metrics on each part of the Astronomer stack. dbBootstrapper is a utility that initializes databases and create Kubernetes secrets, and runs automatically when an Airflow cluster is created.